The primary goal of the Health Sciences Center's Center for Brain Recovery and Repair is the development of therapies designed to improve the quality of life for New Mexicans with brain injuries. We aim to develop interventions targeted to specific pathways or mechanisms to improve motor or cognitive function, and be safe and effective when delivered at time points after discharge from the emergency room or intensive care unit. We currently focus on recovery from stroke and traumatic brain injuries. The Center is part of the NIH IDeA program, funded as a Center of Biomedical Research Excellence (P20GM109089). We opened our doors in UNM Domenici Hall in the fall of 2015. In addition to creating a critical mass of investigators in the field of brain recovery and repair, our facilities are also available for use by other investigators on a fee-for-service basis. The Center received a supplemental grant (P20GM109089-02S1) in July 2016 to create a Core Administrative Unit (CAU). 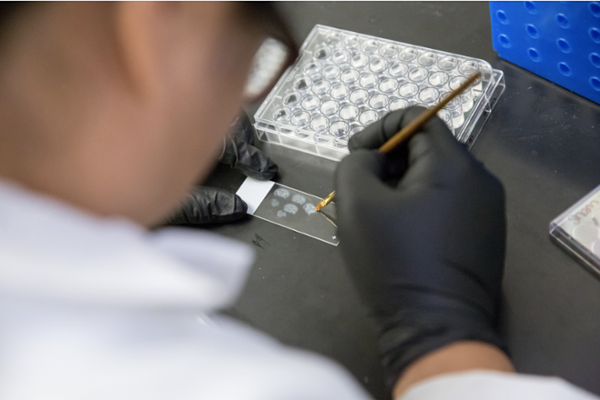 The CAU was created to provide a much-needed single-point contact for all investigators to the UNM research cores in Domenici Hall. The supplemental grant also allowed for core optimization and consolidated nine separate cores down to six. The Center includes both pre-clinical and clinical research studies of efficacy and mechanism, but we are purely a research center and do not provide clinical care. We are purely a research center, and do not provide clinical care. For information on clinical services please call 505-272-3160. For information regarding community brain and behavioral health events and services, please contact our BBHI Community Liaison, Pari Noskin.